A tight turning radius and scrub head lock-down feature allow the mid-sized Wrangler 2016 to tackle heavy scrub and standard scrub jobs with ease. Its 20-inch scrubbing path makes quick work of any task. A rugged, rotocast-polyethylene body and 7-guage steel frame deliver long term durability. Squeegee 32 in straight swing-type with breakaway feature; picks up in forward and reverse. 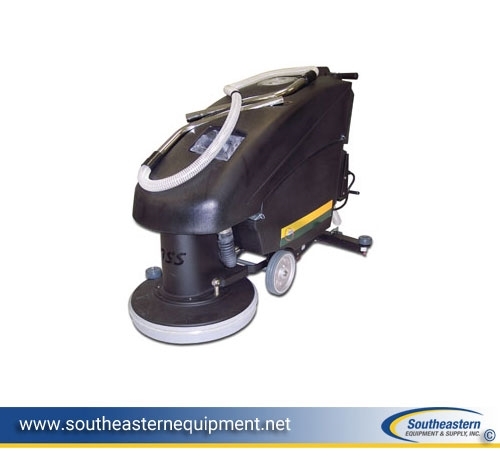 Large tanks—16-gallon (61 l.) solution and 17-gallon (64 l.) recovery— keep this mid-size scrubber on the job longer. Battery-powered models include an on-board battery charger for convenient recharging anywhere an electric outlet is available. Swing squeegee with breakaway feature and Linatex blades provides excellent pickup even on turns, both forward and reverse. Front-fill and drain of tanks save time. Both functions can be completed by simply taking the machine to a slop sink, without turning it around. Reconditioned Advance PBU 27" Propane Buffer 17HP Kawasaki Reconditioned Tennant 2370 Corded Burnisher Floor Polisher 20" Reconditioned Tennant 3640/6080 LP Walk Behind Sweeper Demo Powerboss Apex 49 Rider Battery Sweeper 40"